Australia face a mammoth task to save the first Test on day five in Dubai after closing day four 325 runs behind with seven wickets in hand. Fast bowler Mohammad Abbas’ triple strike ruined Australia’s rearguard plans as they reached stumps at 136/3 in their chase of 462. 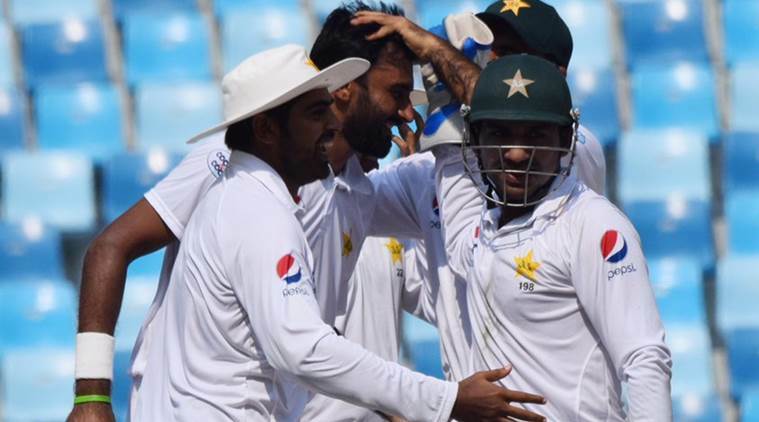 Earlier, Debutant Pakistan off-spinner Bilal Asif ripped through the Australian middle-order with six wickets as the visitors were bowled out for 202 on the third day of the first Test in Dubai on Tuesday. STUMPS! At the end of day Day 4, Australia are 136/3 and still need 326 runs. Travis Head (34) and Usman Khawaja (50) are unbeaten at the crease. Will Pakistan snap the rest of the wickets on the final day? Join us for all the live action. OUT! Aaron Finch has been LBW out and Pakistan get their first breakthrough. Mohammad Abbas gets the first breakthrough. AUS 87/1. Still need 375 to win. Usman Khawaja and Aaron Finch are out in the middle. Mohammad Abbas starts off with the ball in the final session. TEA! Good start for Aaron Finch and Usman Khawaja. The duo have taken Australia to 72/0 at the close of the second session. Australia still need 390 runs to win. Aaron Finch and Usman Khawaja have taken Australia's total over 50. They have ensured that they do not lose quick wickets. Aaron Finch and Usman Khawaja are out in the middle to bat for Australia. Mohammad Abbas and Mohammad Hafeez leading the attack for Pakistan. CHASE IS ON! WICKET! Nathan Lyon dismisses Asad Shafiq. Pakistan declare their innings at 181/6, with a lead of 461. Australia need 462 to win. LUNCH! Pakistan 155/5 at Lunch, lead by 435 runs. Imam-ul-Haq walks back having scored 48 runs. Jon Holland notices the intention to come down the track and tosses up the delivery outside off forcing Imam into a bigger lunge. In so doing, Imam chips it back to Holland. Australia don't celebrate much, plenty to do still. With Pakistan still not losing in the day so far, the visitors have crossed the 100-run mark in the 2nd innings, taking their total lead to 380 runs. Haris Sohail and Imam-ul-Haq have added a quick 53 runs together in the first hour of the day. The duo have faced the early pressures with confidence and are steering Pakistan towards a hefty total in the 2nd innings. With both the spinners Nathan Lyon and Jon Holland ineffective this morning, skipper Tim Paine brings in fast bowlers cavalry. Mitchell Starc comes into the attack. Haris Sohail is on fire! Haris Sohail has made his intentions clear early on. He wants to go after the bowlers to try and get quick runs on the board and put Australia on to bat as quickly as possible. Sohail has already moved on to 14 in 20 balls. Imam-Ul-Haq and Haris Sohail out to the middle for Pakistan with the bat. Nathan Lyon, who still has four deliveries to bowl from the previous day, will continue with the ball. HERE WE GO! Hello and welcome to our Day blog on the Day 4 of the 1st Test between Pakistan and Australia. Things have not worked out for the visitors so far in this Test and after getting off to a good start with the bat, Australia's middle and lower order completely collapsed, putting the hosts in command. The Day 4 will be all about how long Pakistan bat on and what target will eventually be set for the Aussies. Debutant Pakistan off-spinner Bilal Asif ripped through the Australian middle-order with six wickets as the visitors were bowled out for 202 on the third day of the first Test in Dubai on Tuesday. Australia openers Usman Khawaja and Aaron Finch had launched a strong reply to Pakistan's first innings total of 482, reaching 137-0 without at Lunch. 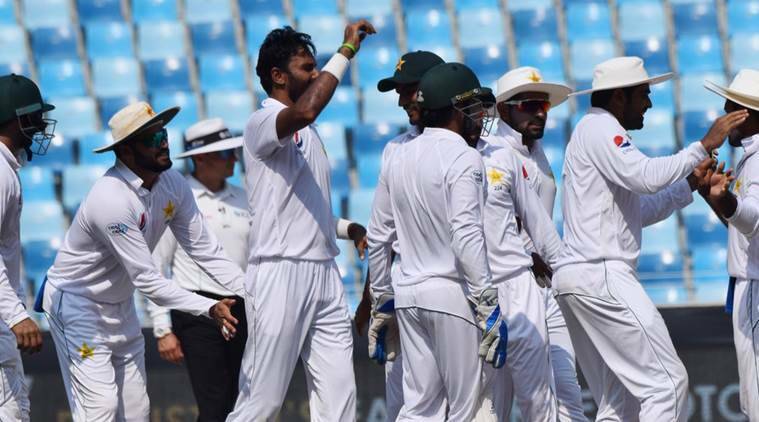 Pakistan were rewarded for their intelligent field placement as the tourist lost their first wicket at 142, with Finch caught for 62 after a sharp catch at silly mid-on from Asad Shafiq.